It fell to me to introduce Spies Under the Bed the third session of the afternoon at the Clapham Book Festival. 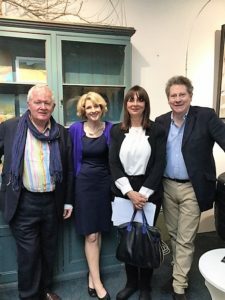 Andrew Lownie, biographer of Guy Burgess, Jane Thynne, creator of the fictional spy Clara Vine and Rick Stroud, chronicler of the women of F section of the Special Operations Executive waited, in the spotlight, with their Chair, Elizabeth Buchan. Their discussion covered the minutiae of active spying, from Guy Burgess’ ‘drops’ of information ( sometimes so shambolic that his briefcase burst open and secret documents were scattered on the floor ) and his fabled charm to the amateurishness of war-time spy preparation. It was incredibly moving to hear about the heroic ends and massive betrayals of the women of F section and about Noor Inayat Khan aka ‘Madeleine‘ whose last word to her Gestapo torturer was ‘Liberte’. Many of these women, if they survived, were treated badly by the country for which they had risked so much and one, a Polish countess, was, for many years, refused British citizenship. The relationship of the spy and his/her ‘handler’, the habit of deceit and impossibility of having any other honest relationship, the double standards and cover-ups, all were touched on in a wide-ranging discussion. Then there were questions and the discussion concluded. The theatre slowly emptied, people wanting to speak with the panelists. Outside in the Bar books were sold and signed. And that was the end of the afternoon session, which meant a big gin & tonic for me. 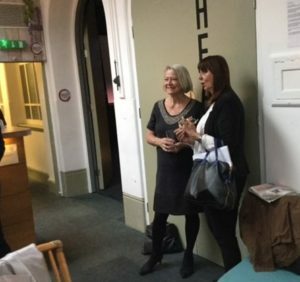 Only two more events to go and one of those was Kate Adie, which involved me in no activity other than to listen and present a gift at the end. The Bar area now began to feel quite crowded as fellow Clapham writers and authors assembled for the evening Meet & Greet – Henry Hemmings ( who could have appeared in the Spies session ), Giles Morton, Carol Topolski (who could have been on the Death Panel ), were just some of them, as well as the authors who had been performing already. There were also local publishers like Catriona Isbester of Claret Press. 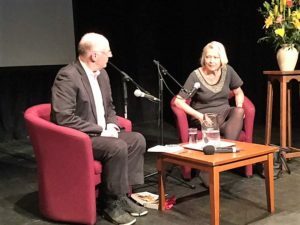 Several interesting conversations ( and glasses of wine ) later the bell rang again and we were into the theatre for the final session of the day – Kate Adie speaking with Simon Berthon. Ms Adie doesn’t participate in the ‘festival circuit’, though she does appear in support of causes with which she agrees. 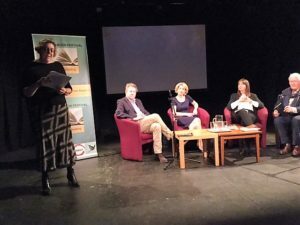 In this instance the approach had been via her agent, but she was happy to support a small south London book festival run by writers. And this part of south London was anxious to hear her. 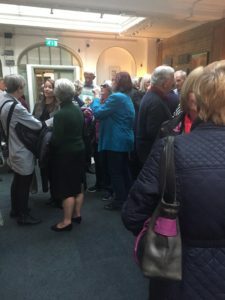 The theatre was packed, the complimentary tickets had been released for sale and the theatre manager ordered additional seating to be placed at the front. It had been half or three-quarters full for the earlier sessions but this was something else. She began by recalling her time as a war correspondent in the first Gulf War but ranged over her experiences around the globe. Her description of the Chinese state’s crack-down on Tiananmen Square was very moving, as was her tale of East German border guards treatment of Germans, usually elderly, who were crossing to the West. In contrast, her stories about life as a cub reporter for Radio Durham were very amusing, she wasn’t afraid to laugh at herself. The hour went all too quickly and the question session at the end could have continued for much longer, but it was late already and we had to clear up. Reluctantly Simon ended the session and, to rapturous applause, the Clapham Book Festival 2017 was brought to a close.